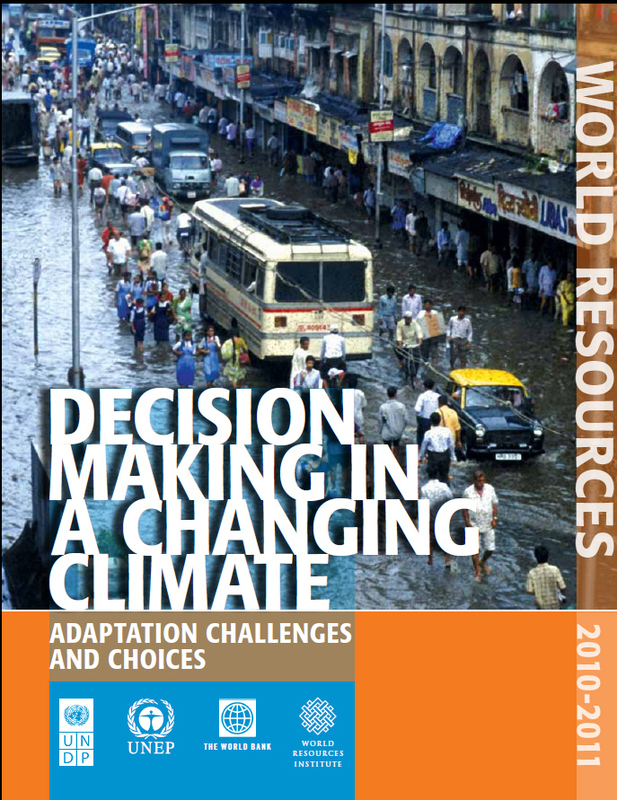 The 2010-2011 World Resources Report focuses on the imperative of adapting to climate change. Its goal is to help policy makers - especially in vulnerable developing countries - to answer the critical question: how do we make effective decisions in a changing climate? In response to the needs of our audience, this report departs from the previous single publication format, employing an interactive website and a range of research tools including expert perspectives, scenario exercises, and sectoral case studies. Findings from these research activities inform a policy guidance report for national level developing country officials. The WRR would like to acknowledge the generous support of the World Resources Report from the United Nations Development Programme, the United Nations Environment Programme, the World Bank, the Norwegian Ministry of Foreign Affairs; the Netherlands Ministry of Foreign Affairs; the Office of Development Assistance of the Ministry of Foreign Affairs of Denmark (Danida); and the Swedish International Development Cooperation Agency (SIDA). This effort is also made possible in part with a grant from the Climate Investment Funds' Pilot Program for Climate Resilience. We are very grateful. The world is already experiencing the destructive effects of rising global temperatures, altered rainfall patterns and extreme weather. In the short term, such impacts create pressing needs for disaster relief and reactive climate adaptation measures. But medium and long term effects will almost certainly be much more disruptive. Wide-ranging impacts, including on agriculture, ecosystems and human habitation, will continue for decades and many will grow in frequency and intensity. Likely impacts include the inundation of deltas and low lying islands and droughts and floods triggered by altered rainfall patterns on a scale not seen today. Agriculture and water resources will be especially hard hit. Availability of freshwater in Asia is projected to decrease significantly as a result of climate change and other stressors, negatively impacting more than one billion people in the next four decades. As global temperatures rise, impacts around the world will also include unforeseeable surprises that are difficult to plan for. Faced with this reality, governments, multilateral institutions, civil society and communities must seek to build the resilience of both current and future generations to climate impacts. In so doing, they must tailor their responses to the specific characteristics and unpredictable nature of climate change. Today, and for decades to come, national decision makers working in developing countries in areas ranging from agriculture to forestry and water management to electricity production, will need to factor climate change risks into their planning and policies. This presents a monumental challenge for a world already struggling to overcome pervasive development challenges including hunger, water scarcity and lack of basic human services. In Africa and Asia many countries are set to fall far short of meeting the 2015 anti-poverty Millennium Development Goals; worldwide 2.6 billion people still subsist on less than US$2 a day. Decisions made over the next few years on adapting to a changing climate will have far-reaching implications for future generations and for development outcomes in Africa, Asia and Latin America. Many of these decisions will be in the hands of national government officials responsible for management of vulnerable sectors. Below are a few examples of the kinds of complex, multi-faceted decisions such policy makers will face. You are planning how to allocate water resources for the desperately poor western Sahel. Some climate models predict the region will become much more arid; others that rainfall and vegetation will become more abundant. Are there decisions you can make that withstand both projections? You are an Asian urban planner whose city is located on a major delta. Climate modeling forecasts sea level rise and saltwater intrusion into drinking water aquifers over time. What resources do you need, and what barriers must you overcome, to make decisions today for circumstances that may not manifest themselves for years to come? You work in a water planning ministry for a region of South America predicted to suffer from prolonged droughts. What preparations can you make to protect local populations against these shocks? the likelihood of "surprise" impacts that can't be anticipated. In addition, information generation and governance is decentralized and fragmented in many countries. This presents challenges for decision makers seeking to gather relevant data and knowledge, coordinate problem solving and planning, and share best practices. WRR 2010 has identified five key elements of decision making for effective climate change adaptation [which inform our research and recommendations]. Proactive - anticipates climate change's uncertainties, changes in mean state and variability and the time lag involved in climate impacts. Adaptive - flexible and able to adapt to new information and conditions. Durable - responds to the longer term nature of climate change. Robust - withstands uncertainty and serves multiple scenarios. For more background on the framing of the World Resources Report, and its research elements, click here.